Female students brought to Gaddafi after the speeches he made in the university amphitheater could be treated and released. The women had no recourse but to keep silent and abandon their education, the book claims. The horror started with the lightest of touches. As the 15-year-old schoolgirl held out the bouquet to the 62-year-old man, he took her free hand and kissed it gently. The man was Muammar Gaddafi, the dictator of Libya who had seized power 35 years before. His people were forced to call him the Guide, but the rest of the world knew him simply as Colonel Gaddafi. That morning in April 2004, Gaddafi was visiting a school in his home town of Sirte, on the Mediterranean coast 350 miles east of Tripoli. The girl had been selected to present the Guide with gifts and flowers, and it was considered a privilege. Before Gaddafi arrived, she was trembling with nerves, and she continued to tremble as he looked her coldly up and down. He squeezed her palm and then her shoulder, before gently patting her head. At the time she was euphoric. To have been touched by the Guide! It was a real honour. She had no idea that the pat on the head, seemingly so paternal, actually signified something far more sinister. The car arrived the next afternoon. The girl was working at her mother’s hairdressing salon when in walked three women, one of whom was dressed in a military uniform. The women told the girl’s mother that her daughter was needed to present another bouquet to ‘Papa Muammar’ because she had conducted herself so ‘beautifully’ the previous day. Despite the mother’s protestations, the girl was driven away at high speed to an encampment in the desert. Now terrified, the girl was taken away and undressed. Her measurements and a blood sample were taken, then her entire body was shaved except for her pubic hair. She was made to wear a G-string and a low-cut dress, and make-up was plastered on her face. 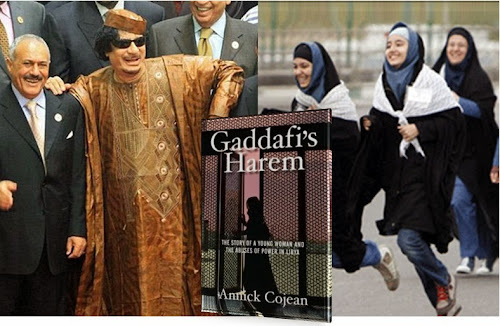 She was then shoved into Gaddafi’s room. To her disgust and shock, he was lying naked on his bed. The girl immediately tried to run out, but one of the female helpers grabbed her and insisted that she did what was required. The girl sat next to Gaddafi on his bed and he started to kiss her. She remained frozen with fear until eventually she could take no more and pushed him away. A struggle ensued until a female helper appeared. The following evening, Gaddafi beat the girl and then got what he wanted.